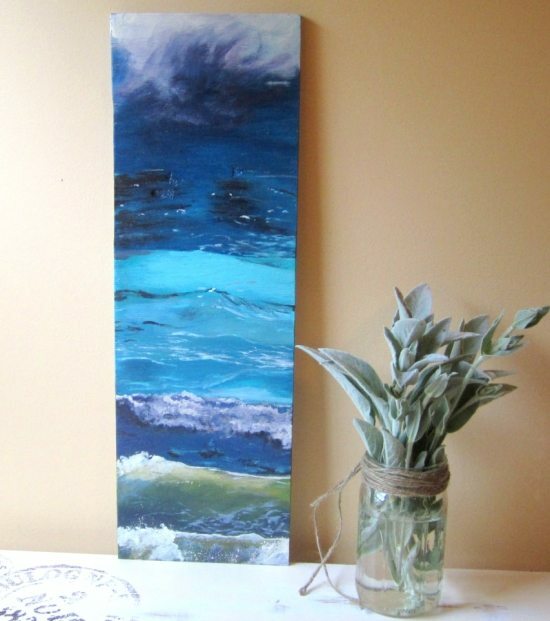 I think every beach and sea lover needs at least one original piece of art that features the beautiful unlimited sea with waves rolling ashore. Just the way you see it when you sit at the beach. 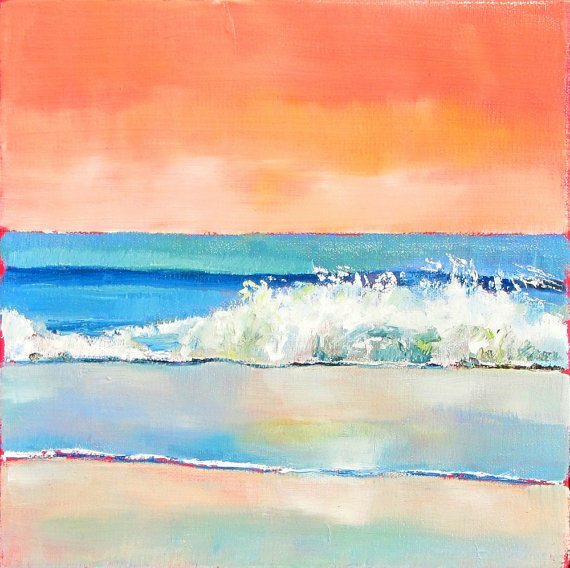 So I turned to Etsy artists to find affordable original beach paintings, checking out countless stores to compile the best options. Keep in mind, these are original works of art, so there is only one available. If a painting has sold, just browse the store and look for something else that you like. Most featured Etsy artists also do commissioned work. For more information, please contact artists directly via their contact info, posted in their stores. Enjoy and find your art! 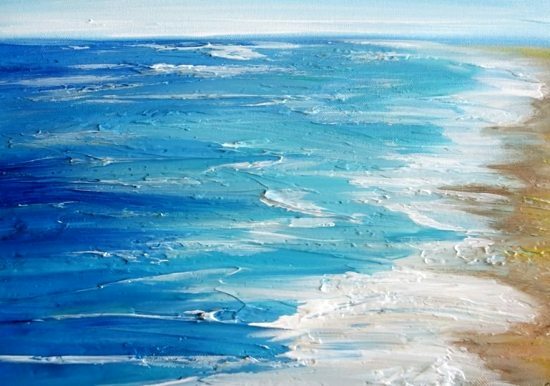 Cathy has an impressive offering of gorgeous affordable original beach paintings that convey a sense of tranquility. The sides of her canvases are painted as well, so that framing is not necessary (which is the case for other canvas paintings also). Her typical sizes are 8×10, 12×12 and 11×14. Prices start at $40. 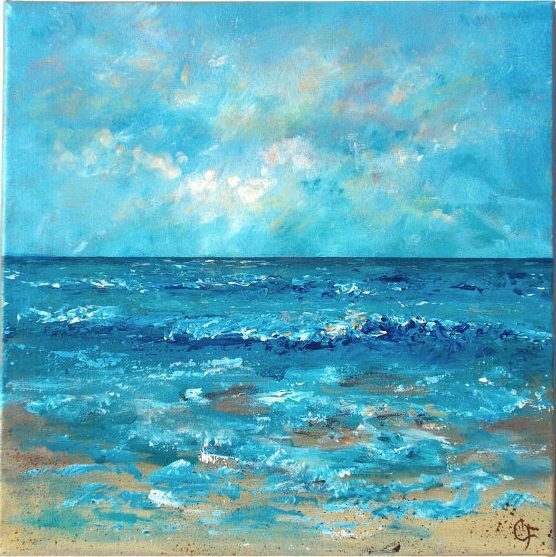 This particular beach painting measures 12×12 inches ($75). Kamara’s beautiful abstract beach paintings are inspired by her love of nature, color, and the beauty of the California coast. Painted on a 11 x 14 inches panel board ($65). While this painting is on the smaller scale at 10 x 10 inches, it sparkles big time with bold colors. The sides are painted rich black, it’s wired and ready to hang ($110). Reflected in Nancy’s art are the coastal environments of North Carolina, her birthplace and where she spends much of her time. This 11 x 17 inches textured beach painting is a steal ($50). I hope that it is still available! Sheila has a store in Santa Rosa Beach, FL, where see sells her work and also teaches art classes. 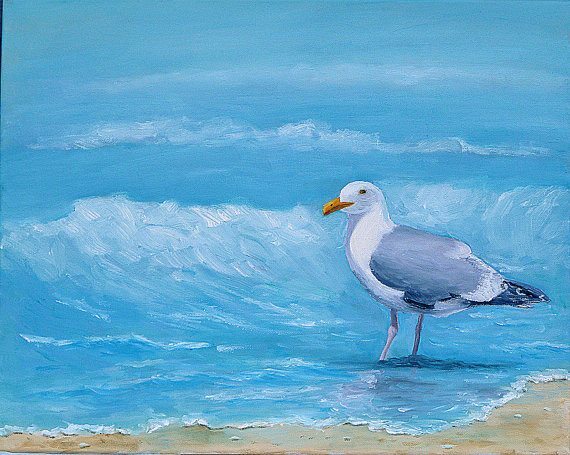 Another awesome opportunity to purchase a beautiful piece of original beach art at a very affordable price is this 16 x 20 inch seagull painting (on sale for $75). Kay painted it during a walk he took one morning at Rockaway Beach along the Oregon coast. 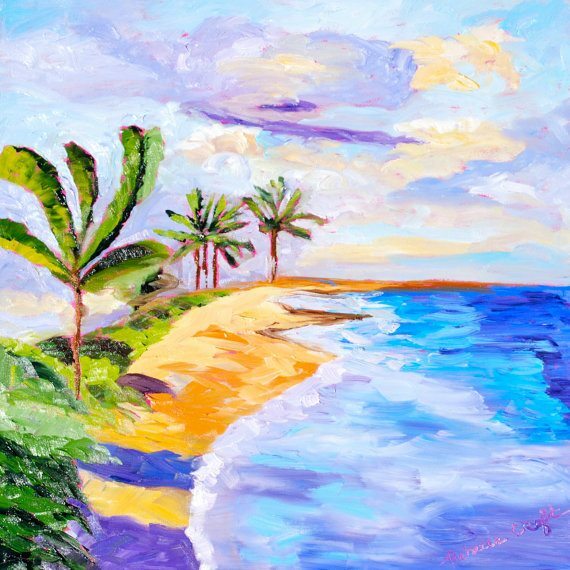 A delightful 20 x 20 inch beach painting that includes palm trees ($149). Rebecca especially likes to paint landscapes from places she has traveled both from photographs and plein air. An original hand painted piece of art on a reclaimed piece of wood. I love the vertical format. A great fit for a narrow space. The piece measures 7.75 x 24 inches ($85). Ashley paints wooden signs, personalized custom signs as well as other signs. And I’m loving this kind of canvas too! 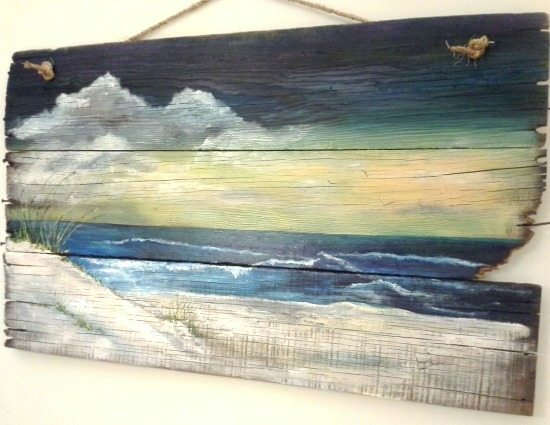 An original beach painting on wood that measures 26.75 x 23.25 ($149.95). 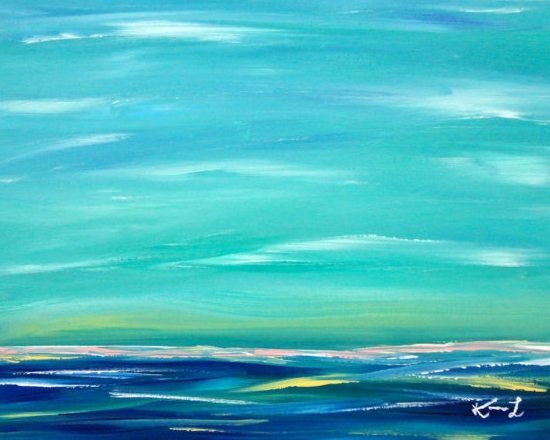 Although this painting is sold, Lori takes orders and will paint yours as close to the original as possible. She has other examples in her store too. Three panels of reclaimed wood have been attached together with wooden supports. Painted in acrylic paint in colors of deep blues, whites, yellows, turquoise and natural colors. Wow! I looked at my shop stats and saw that I was featured here! Unfortunately my name is not “Tamara” it’s Ashley. I painted the vertical beach scene. 🙂 Thanks again! I corrected your name. Thanks! !